IN HOC SIGNO AMAS. This Latin phrase means "In this sign you love". TURRIS FORTIS MIHI DEUS. This Latin phrase means "For me, God is a strong tower". 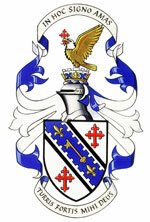 In general, the symbolism of emblems prior to 2000 does not exist in an appropriate format for the online Register. 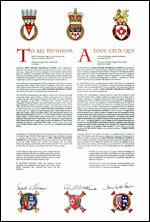 The announcement of the Letters Patent was made on November 23, 1996, in Volume 130, page 3280 of the Canada Gazette. 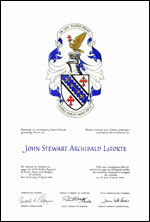 Original concept of Stewart Leforte and Robert D. Watt, Chief Herald of Canada, assisted by the heralds of the Canadian Heraldic Authority.